With her camera, not a gun. Jessie Stevens of Simply Jessie Photography is beginning a new series on her blog: mini interviews with local small business owners. You can read my interview full of profound thoughts and great wisdom; see part one and part two. People, I really don't like having my picture taken. I tend to become paralyzed with fright and can't figure out what in the world to do with my hands or my teeth or my chin or my eyelids. Somehow Jessie made me forget about all that, which is a complete miracle. (I recommend rolling around in a pile of fabric and feigning sleep as one way to help get past it.) We laughed a lot. Jessie provided exactly the right amount of direction; she's a pro. If you want gorgeous photos but hate getting your picture taken, she's your photographer. And for a limited time, she's offering a discount on photo sessions. Fill out the contact form on Simply Jessie's site. Mention "How About Orange" in your comments to get 20% off a full family portrait or 15% off an entire wedding package. But you must book by Friday, May 14th! Both great interview posts and photos. I love the one of you laying in the fabric.. you're obviously surrounded by what you love :) Keep up the great work! And now I understand about the yak. What do you mean? I think it's a very flattering shot of my thumb and index finger. True. But the rest of you looks like I don't have my glasses on. 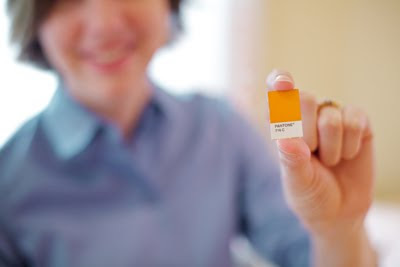 However, it IS a great photo of the pantone color chip! You're right, LACL... and it's even the right color. I like the part "I can decide in a nanosecond"
what a relief that she shot you with a camera, and not a gun! Okay, fine, Megumi. I may have exaggerated slightly. Maybe a full second, not a nanosecond. Awesome! I love your red shirt. Love the photos and interview!!! i would like to add, that i look forward to your time waster posts. they are truly worthwhile when i feel "stuck" with a design or project. and, sometimes i retest myself on the font or cheese game! And I gotta admit it, that deodorant post was too funny. ha! :) I like all your diy posts best. And anything with orange, of course! It's so nice to get to know you a little better :)! Thanks for the blog, and thanks for sharing YOU.